Thankful Thursday - What's In A Name? 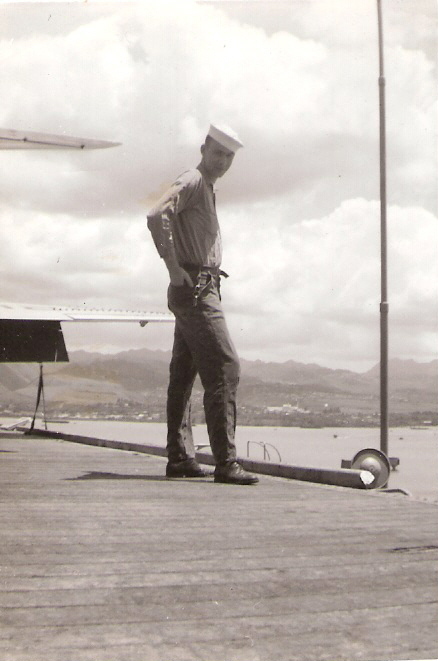 Happy Birthday to My Hero, My Daddy! For those of you who have been following my blog this week, you will recognize the DuBois family whom I have been working on. This is the family of my gr-gr-gr-grandparents. Born in 1840, my gr-gr-grandmother, Anna [Annette] was born to Nicholas DuBois and his wife Magdalain Houin. 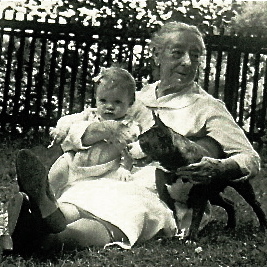 Anna was the DuBois' first born child. Nicholas [1858-1923]; Lawrence [b.1860]; Alfred [b.1863]; Charles [b.1868]; Adeline [1867 - 1958]; Joseph [b.1870]. It is in 1870, following the birth of Joseph that Anna dies. In 1871, just a few months after the death of Anna, Joseph remarries. This time to Anna's younger sister, Adeline. [It is Adeline that Anna's youngest daughter is named after. Adeline [the younger] is my great-grandmother. Adeline [the elder] is left to raise Anna's six children, the youngest being a baby. At the same time, Joseph and Adeline begin having children of their own. Nine to be in fact! They are: Joseph [1872 - 1874; it is unsure if this is the same child as Anna's last born or not. If he is not, then Anna's son Joseph died as an infant. ]; Frank [1874-1880]; Louis [1875-1968]; Mary [1879-1957]; James [1882-1962]; Hattie [1883-1967]; John Edward [1886-1966]; Gilbert [1888-1969]; and Flora [1890-1956]. Adeline Josepha DuBois Eve with one of her grandchildren and a beloved pet. This is one of our favorite desserts of all time! Rich, sweet, and a taste of pure heaven! In a heavy pot over medium/high heat bring the ingredients to a boil then reduce heat to a simmer. Mix the dumpling ingredients together in a medium mixing bowl. Then drop by tablespoonful into the blackberry mixture. After dropping the dough into the pot, cover with a lid and leave to simmer for 20-30 minutes. Dumplings will be light and fluffy and infused with the blackberry liquid. 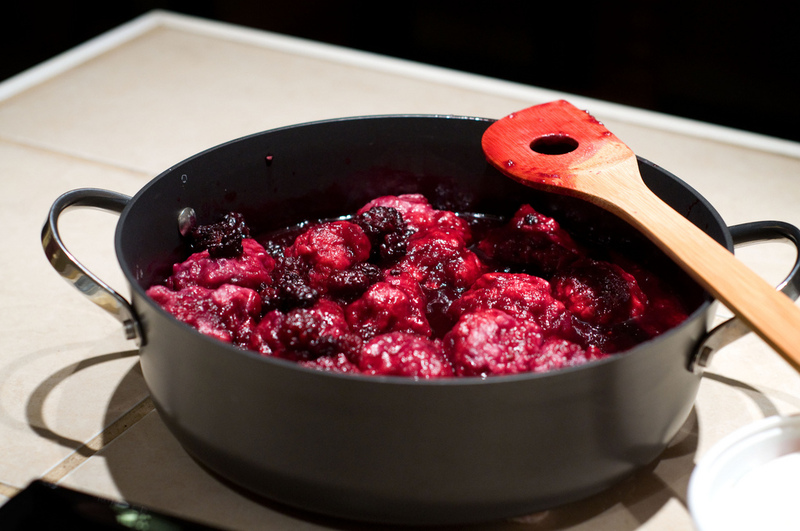 Serve warm [one dumpling and a big spoon of berries per serving]. Top with vanilla ice-cream. This is one of those summertime favorites that will have your tongue slapping your forehead silly wanting more! 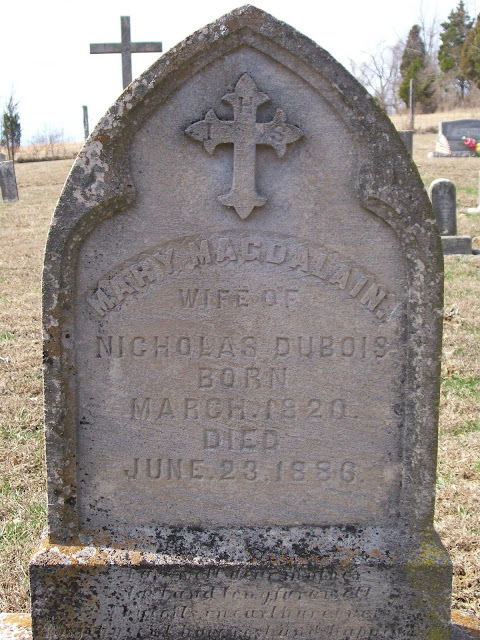 As you will know, if you have been following my blog for the past few days, I have been concentrating on my gr-gr-gr-grandparents, Nicholas DuBois and his wife Magdalain Houin. 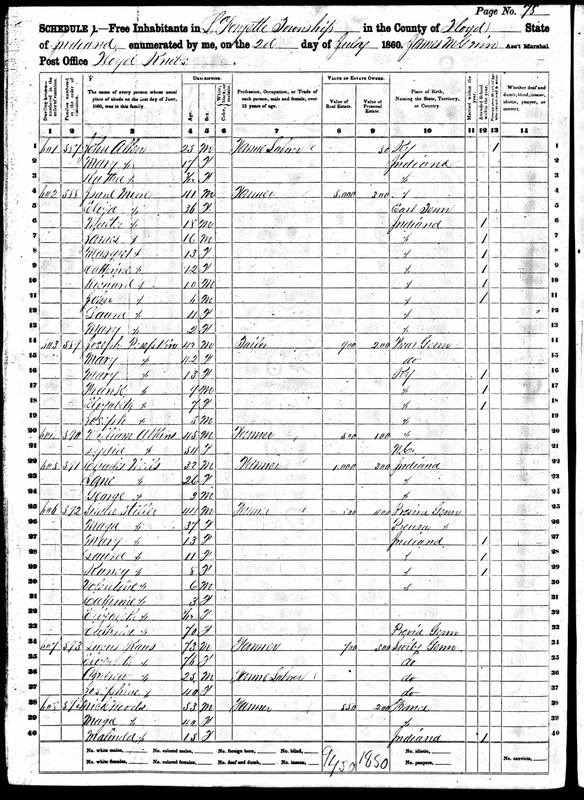 I was able to locate the family on the 1880 Census. 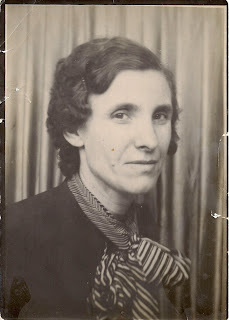 But, other than a few kindly hints, [long ago someone gave me a list of their children, but I'd had no proof] I was unable to tie them to my gr-gr-grandmother, Anna/Annette. I had been told that after her death, her husband married Anna's sister, Adelaide. But, again, I had been unable to find proof. 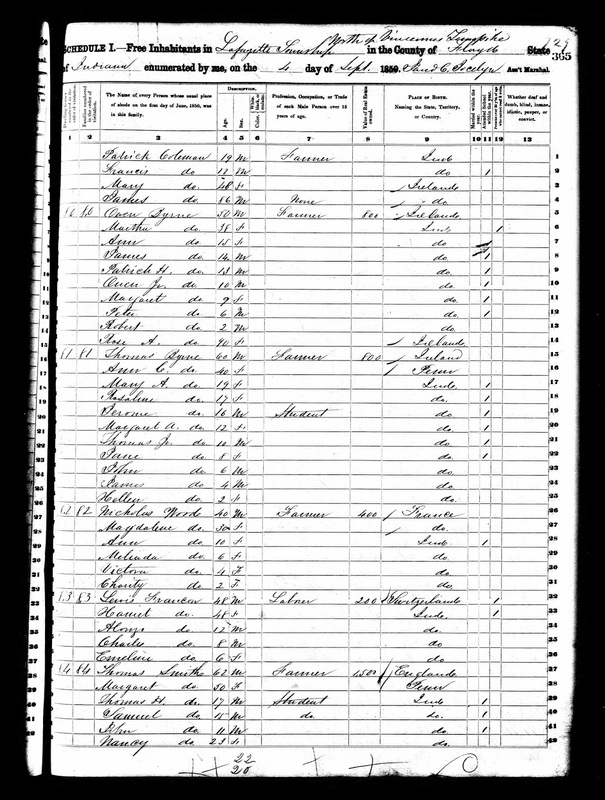 By the 1880 Census, the Dubois' were in their 70's and 80's, and Anna had already died. I feared I would never locate the family together! Then this week, I decided to look at the family abstractly. DuBois was French, this I knew. However, I had never taken French in high school [had I known I would love this search so much, I would gladly have opted for French over Spanish!]. So with the aid of an online translator, I found that DuBois literally meant "The Wood". So, let's see if we can locate a Census record with at least most of the family listed on it. And suddenly there it was! Not just a census record, but how about three of them! 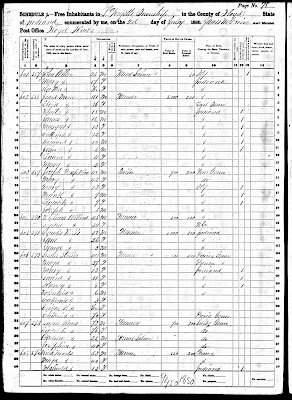 We now have the 1840-1860 census records with all of the children, sans one [who is supposed to have died as a toddler], listed on them! 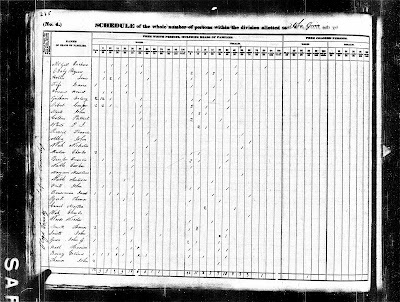 On the 1840, 1850 and 1860 Census my ancestor's were listed as the Woods family! But by the time the 1880 rolled around, they were using their native surname of DuBois. This is why I have had so many problems locating them! Sometimes it seems we must step out of the box and try a new approach to get the results we most want. And that is my Thankful Thursday for the week! I am thrilled to say I have found a photograph of Nicholas DuBois' wife's tombstone! I had been searching for this for several years, and here it is! 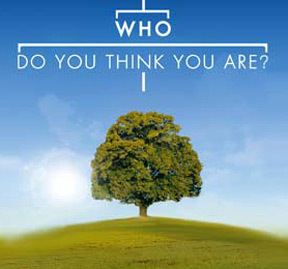 Like most of America, or at least those whose interest lies in genealogy, I spend my Tuesday evenings glued to The Learning Channel [TLC] and Lisa Kudrow's wonderful genealogy program, Who Do You Think You Are. Tonight's episode was no exception to the great story lines and research often seen on this show. Tonight, supermodel Cindy Crawford went in search of her ancestors. Cindy Crawford was one of the world's first true supermodels. Her career soared and she was the highest paid model of all time. Cindy lives in Malibu, California with her husband and two children. But she grew up in DeKalb, Minnesota surrounded by family. She was blessed to have known all four of her great-grandmothers. "Having a sense of connection to history is important," she says. 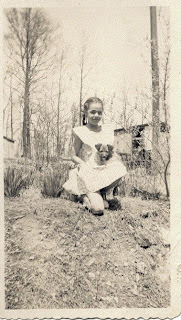 Cindy's father's mother was Ramona Hemingway, and Cindy often wondered if there was a connection to author Ernest Hemingway. Ramona's parents were Frank Hemingway and Hazel Brown. Frank was a popcorn farmer. He wanted a family of boys, and instead was blessed with a family of eight daughters. It is Frank's family that Cindy wants to know more about. And so she turns to our old friend, and standby, Ancestry.com. It is on Ancestry.com that Cindy finds Frank's father, Louis Hemingway. And she learns he was born in Vernon, Blue Earth, Minnesota. 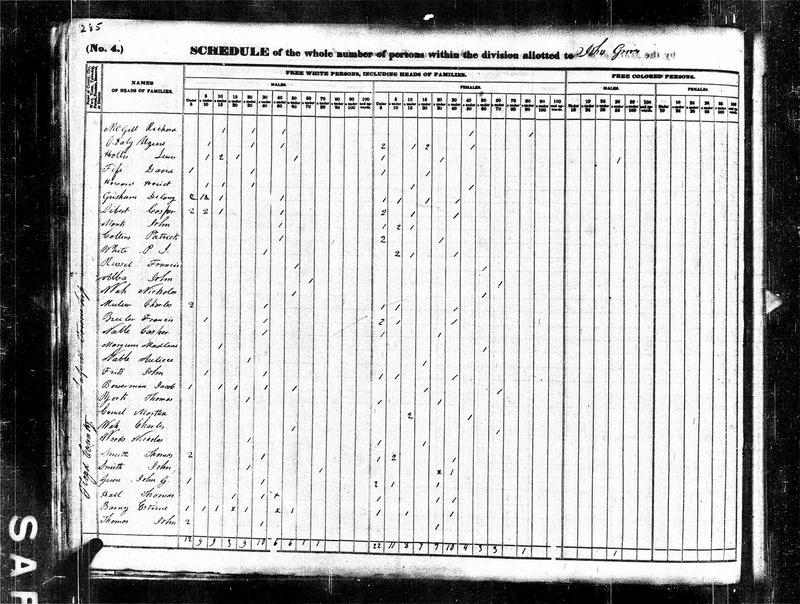 In looking through Census records, she finds that Louis' father was also named Frank, and that he had been born in New Hampshire in the mid-1800's. So, Cindy is off to the New England Historical Society in Boston, Massachusetts, where she meets with genealogist Christopher Child. Cindy learns she is, indeed, a distant cousin to Ernest Hemingway. 8th cousin, twice removed to be exact! Cindy learns that her 5 times great-grandfather, Louis Hemingway was married into the Trowbridge family. Cindy learns that her 10 times gr-grandfather actually came from England. She is shown a book of Trowbridge family genealogy and she finds this gr-grandfather, Thomas Trowbridge among the persons written about. Thomas was the son of John Trowbridge of Taunton, England. Thomas married a woman named Elizabeth and had four children, the youngest born in 1633, while in England. Thomas and Elizabeth came to America, and Cindy's 9 times gr-grandfather, James, was born here in 1636 in Dorchester, Massachusetts. This was a period called The Great Migration in our history. The Trowbridge's were Puritans like the Pilgrims. They came to America for religious freedom and opportunity. Thomas Trowbridge was among the settlers of the New Haven Colony in Massachusetts. Cindy is shown the book, "The New Haven Colony", and Thomas Trowbridge is shown among those first settlers. He was a "Congregationalist". Cindy states her grandparents remained as Congregationalists and remarked how that had stood the test of time! To learn more, Cindy is off to the Connecticut State Library at Hartford, Connecticut to learn more. Here she meets with historian Judith Schiff. Ms. Schiff has unearthed a couple of court documents regarding Thomas. On 3 November 1641, Thomas' belongings were to be sold to pay debts he owed. On April 1644, the matter of paying his debts is still unsettled, and his family was to be dissolved and his children placed with another family. There is no record of his wife, and speculation may be that she has died. It then appears that Thomas has married in 1641 and has gone back to England. So Cindy is now off to Thomas' hometown of Taunton, Staffordshire, England. Here she meets with historian Susan Hardman Moore. Ms. Moore states that at that time there was a lot of unrest. King Charles was at war with the Scots, and so there was a surge of people returning from New England to England. In the Taunton Quarter Session Rolls, in October 1652, Ms. Moore uncovers a document showing Thomas Trowbridge attempting to help a soldier who had served under him obtain pension. It seems that Thomas was a Captain under Colonel Robert Blake in the Parliamentary Army. In 1642 when Civil War broke out, Thomas chose to fight. Taunton was the center of resistance against King Charles. So, Cindy is off to the Taunton Castle to learn more. Here she is met by historian Bernard Capp. 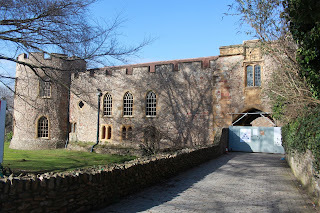 In 1645 Taunton Castle was the ultimate stronghold and was targeted by King Charles. A long siege was waged against the Castle and the people of the surrounding area. It is said that the Castle was under siege so long that the thatch roofs of houses were being used as hay for the horses, and they were down to their last 2 barrels of gunpowder before the siege was lifted. An ultimatum was given by the King - "Surrender or die". But the siege was lifted and the community, and castle, were restored. At this point Cindy was given an eye witness account of the siege to read aloud. In 1646 the war ends and King Charles is overthrown. Cyndi finds pride in this many times gr-grandfather "who cared for those who served under him". Here Cindy is going to London, to see if she can go back even further with her family history. Here she meets with genealogist Charles Mosley who has a very large scroll for her to view. He immediately shows her the next 10 generations back. When Cindy is quite impressed, he then shows her back more than 40-generations, to none other than Charlemagne. Cindy is off to Aachen, Germany where she meets with Prof. Rosalind McKitterick to learn more about this ancestor. It is in the illustrious Palace Chapel, where Charlemagne spent most of the latter years of his life, where Cindy learned how he conquered and ruled most of what is now Europe. She learned he fathered 20 children. Cindy read aloud Einhart's description of Charlemagne, and she learned he was not just a conqueror, but he also promoted culture and learning. Cindy stated in closing, "I have a connection... to the person Charlemagne...a real tangible link." Not every one can learn of more than 40 generations of their family, and have them each and every one so well documented. It was fascinating, and fun!, to watch as Cindy Crawford did just that this evening. Next week, be sure to be watching as singer Trisha Yearwood learns about her ancestors! 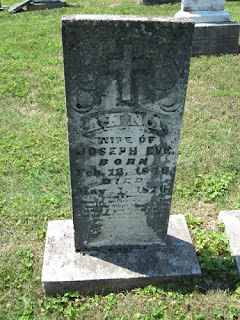 Below is a snapshot of my gr-gr-gr-grandfather's tombstone. 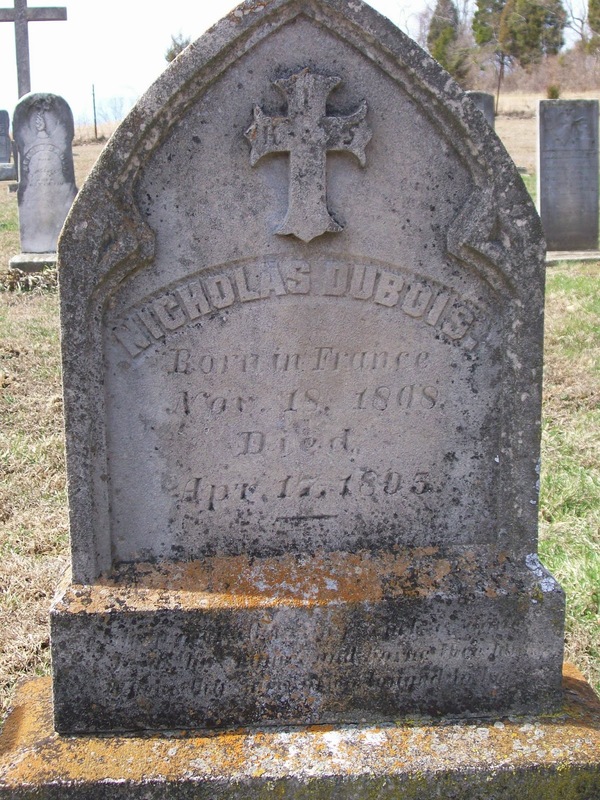 Nicholas DuBois was born in France. Just where, I have been unable to ascertain at this point. He arrived in this country on 05 Jun 1832 aboard the Brig Larpool. He left France and boarded the Brig Larpool in Liverpool, landing in New York. I know the couple had at least 3 children, and most likely more. 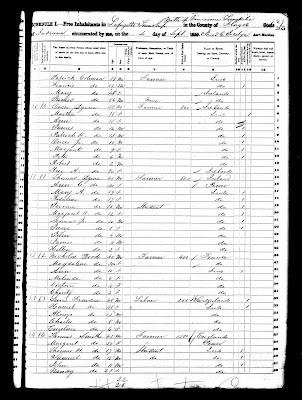 Nicholas, Magdelena and two of the children are found on the 1880 Census. Nicholas is then in his 70's. Today we're going to look at my Matrilineal line. This is a line I don't talk about as much as the other line, as sometimes it is very difficult to locate information on it. However, I hope to be able to set down more time to research this line, and perhaps take that much needed trip to Indiana for research soon! 1] Lois Velleda Dreher - born in Indiana. This is not a very long lineage, as you can easily see. And while there is very little I know, beyond my great-grandmother, about these women, I continue to strive to find out as much as I possibly can. Having grown up in church, and spending most of my adult life in an old country church, I enjoy Sunday hymns more than anything else on this earth! My Dad tells me that his father did as well. Since I never knew my grandfather [he passed away 5 years before I was born] I almost feel like he passed this on to me, and I am keeping a little something of him alive in sharing these old hymns here. It seems I am always a bit late on Randy Seaver's Saturday Night Genealogy Fun challenges! Nonetheless, I look forward to them each and every week! So keep 'em coming Randy! This week brought a whole new challenge, and something I had not practiced in a long, long time. Making a timeline. 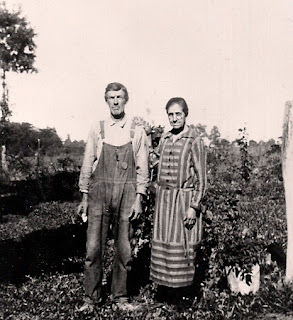 1) Have you created a Timeline for one of your ancestors using a genealogy software program (e.g., Family Tree Maker, RootsMagic, Legacy, Reunion, etc.) or an online family Tree (e.g., Ancestry Member Tree, FamilySearch Family Tree, Geni, MyHeritage, etc. ), or in a spreadsheet (e.g., Excel)? 2) If not, try to create a timeline using the program/website of your choice. If so, create another one for the ancestor of your choice! 3) Show us your Timeline creation, and tell us how you did it. Which program/website, the process you used, and how you captured the images to display your timeline. 4) Share your Timeline creation on your own blog post, in a comment to this post, or on Facebook or Google+. Thanks Randy! I had to put on my thinking cap on this one! I use the FTM 2010 version. Unfortunately, I haven't practiced making a timeline in my program in a long, long while [since I purchased the 2006 program I believe!] so I was completely rusty in doing this. I clicked on the Search function and typed in "how to make a timeline" and nothing regarding a timeline appeared. So I remembered the K.I.S.S. [Keep It Simple Stupid] premise and typed in simply "timeline". Again, nothing regarding a timeline appeared. Knowing that just about any kind of report is done through, and found in, PUBLISH on the program, I was finally able to locate TIMELINE under the PERSON REPORTS. [program-> person-> publish -> person reports -> timeline]. This timeline is for my Great-Great-Great Grandfather, Reverend Samuel Perkins. He was born 21 April 1778 in Virginia and died 19 January 1854 in Greenbrier County, [West] Virginia. The timeline includes his marriages [deaths of the spouse] and the births of his children. 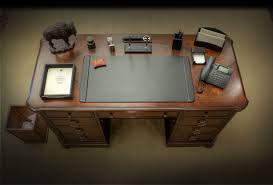 An empty desk. That's what I've had for the last three months. A back injury has had me laid up, and on medication that really wasn't conducive to research or blogging. Would you believe that I nearly missed my own family reunion this year? Never having had a major back injury before, I have a whole new respect for anyone who says that their back hurts! But, I am beginning to feel a bit better, and have returned to my J-O-B [as a geriatric nurse] part-time, and am hoping that the pain clinic will soon see me back at work full-time. And on my days off, wandering cemeteries and doing genealogical research! So, please be watching our blog, for all those crazy posts that we hope to be writing daily! We may have a few surprises up our sleeves yet!